Theridiosoma gemmosum turned up in my tiny garden pond this year. It occurs locally in Sussex in ancient woodlands and on wetlands. Usually I have spotted the very distinctive mini-punch bag egg-sac and that has prompted me to look for the spider, and sometimes I have found them, but only sometimes. This time I had the chance to observe them closely and what I saw astonished me. These odd little spiders are easily our smallest orb web spiders. They always sit uncomfortably as an add-on in books at the end of the section on orb spiders, similar, but tiny and different. I first came across them years ago whilst rummaging in leaf litter under pond sedges for other spiders but initially dismissed them as the babies of some pale theridiid. They have the globular abdomen of a Theridion and the adults are just so small at a millimetre or two. They often shine with silvery patterns so itâ€™s tempting to call them Gem Spiders. Ray Spiders is usual for theridiosomatids though, because they adapt their orb webs by reducing the number of radial lines to fewer 'rays' in the central hub. There are only about 70 known species of Ray Spiders worldwide, mainly from the tropics, and Theridiosoma gemmosum is the only one recorded from Europe. 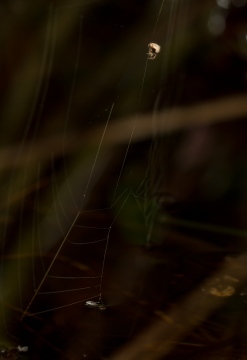 Theridiosoma builds an orb web like typical araneids, but then modifies the hub into the distinctive rays and also pulls the web into a shallow cone using a line attached to nearby vegetation. Sitting in the hub, holding the attachment line, the spider tensions the web. When prey hits, the tension is suddenly released and the orb partly collapses onto the prey (at least that is what they do in text books and sometimes in real life!). Hyptiotes does a similar thing. Theridiosomatids seem to be out on the end of an evolutionary limb with this quirky modification of the web. It is also a little odd that they are so tiny. This unexpected idiosyncrasy and the vagueness of descriptions of their ecology in general spider books give them an aura of mystery. My Theridiosoma had set up home at the edges of tussocks of vegetation in the centre of our small garden pond. I only noticed them when my summer holiday began at the end of July and I was at a loose end and lay down on the lawn, specs on, and stared into the pond to see what was about. I was actually looking for small things, surface film water bugs, but even so it took a while for me to see the adult spiders hanging, apparently in mid-air, dot-like, a few centimetres above the water. Eventually I located half a dozen or so adult spiders, mainly females, in an area of about a square metre. Their extremely fine orb webs were suspended from plants hanging over the water. Astonishingly the webs were fixed along the bottom edge to the water surface. The spiders had glued silk to water! It was only after a day or two of watching that I began to notice the abundance in the pond of newly-hatched Ray spiders. These tiny specks of life were held mid-air by effectively invisible snares suspended from pond plants that sometimes emerged only one or two centimetres, all over the pond. Invariably though, they were constructing their miniature orb webs by gluing the whole bottom edge of the web to the water surface! The spiders not only fix the radial lines of the orb onto the water along the bottom edge, but also attach the hub tension line to the water surface. I watched them do it. They drop to the water, squat, abdomen and legs on the water, for a second or so and then climb up off the water having fixed the silk to the water. This attachment is held by the surface tension and takes enough strain to hold the orb web in shape or even to tension the web into a cone. When under tension the silk line running onto the water pulls the water up around it as if something resists being pulled through the surface. There is a degree of flexibility in the way webs are positioned. Usually vertical, the webs are sometimes horizontal or geometrically draped from vegetation with segments at puzzlingly different angles. The tensioning line may be perpendicular to the web, but more often is at a much shallower angle, near vertical, and connected to the water. Sometimes it appears that the top half of the web is missing, but actually the spider has built the web in a 'folded' format with the top half also glued to the water, the whole web being suspended from the horizontal diameter lines and appearing to be doubled up. Frequently the spiders sit in the centre of a floppy orb with no visible tensioning line as the bottom edge drifts back and forth in the water adhering to any small item on the water surface, alive or not. Plenty of off-water tussocky vegetation was available for web building in the pond but always, the spiders joined the web to the water surface. They operated in a layer on and just above the water, but beneath the webs of other spiders, such as tetragnathids, also constructing webs over the water but higher up and never attached to the water surface. It was lucky that the Theridiosoma in our pond were so easily observed. They are so tiny that noticing them 'in the wild' is usually a matter of chance. You have to be fairly sure of their presence to look hard enough to find them. They build some of their distinctive egg-sacs high in vegetation and although small, they catch the eye. Even then, the most delicate search may find the spiders, but almost invariably destroys the flimsy near-invisible webs. With such difficulty in just locating them and the near impossibility of observing natural behaviour in waterâ€™s edge locations in the field it is not surprising that there is little description of these water surface webs in the general literature. The nearest I have found is Jorgen Lissner on his website The Spiders of Europe and Greenland recording the webs as being 'built close to the water surface'. The spiders themselves are found low down near ground level but always in wet habitats. The species has only been found in southern Britain to date, but it may be more common than we thought. Good places to look include under overhanging plants at the edges of ponds and low down amongst tussocky vegetation in marshes and in sedge and grass clumps in wet areas of woodland. A quick search for information on spiders gluing webs to water turned up a paper on a spider called Wendilgarda from tropical Central America that builds an unusual web with lines attached to the surface of moving streams. The description of the way the spider fixes the lines matched the behaviour of the Ray spiders in my pond. Lo and behold Wendilgarda is a theridiosomatid! There is a major difference however. Wendilgarda trolls the streams with lines of viscid silk, Theridiosomaâ€™s water attachments seem to be normal radial lines of non-sticky silk. When I saw these spiders fixing silk to water I was very surprised. Jonathan Coddington, Curator of Arachnids and Myriapods at the Smithsonian Institute, described the stream-trolling web of Wendilgarda. He very kindly replied to my e-mailed questions and explained that he has seen some other spiders, including theridiids, attach web to water. Apparently accidentally, the spider treats the water surface as if it were vegetation with the normal silk attachment pad working on the surface tension of the water. So fixing silk to water is not unique to theridiosomatids. This observed water surface behaviour of the Theridiosoma did not seem simply accidental though. It seemed habitual and deliberate. Hunting at the surface of water is certainly tapping a rich source of prey. The sticky spirals of Theridiosoma webs come very close to the surface. As the webs become progressively damaged during their use the spirals contact the water and act in a similar way to the trolling sticky lines of Wendilgarda, trapping water surface animals very effectively. In my pond they were catching small surface-dwelling insects from collembolans to small pond skaters as well as many small flies and moths that emerge from, or flutter low over, the water. Could Theridiosoma be specially adapted as a water surface trapper? It is tempting to suggest that it might be. The species always occurs in places where there is water close by or where there is standing water on the ground for some of the year. The adults are small and can use very small pools and the young are so tiny that a flooded shallow Roe Deer slot on the forest floor would be enough of a water surface microhabitat. Perhaps they have other adaptations. Whilst watching them, magnified through my camera lens, I have seen them appear to take something from their mouthparts with their back legs and make repeated 'polishing' movements over their round abdomen. This recurrent behaviour reminded me of a preening duck. Could they be 'waterproofing' to an increased degree to prevent wetting when they contact the surface to fix lines to the water? Theridiosoma is certainly not restricted to using the water surface. Ray spiders do build webs in vegetation above or away from standing water in damp habitats. That is where we normally find them after all. Maybe hunting at the water surface is a speciality of these spiders and more important in their ecology than has been realised just because it is difficult to observe. It may help to explain their remarkably small size. Being so tiny allows the use of the small forces of surface tension web connections. There may be a particular niche at the water surface not exploited by other web-building spiders. Such a niche would be available in typical aquatic habitats and also on wet forest floor environments, where the thinnest of water films would be enough for the very tiny juvenile spiders to construct semi-aquatic webs. Current guides to freshwater life usually have a spider section including Argyroneta, Pirata, Dolomedes and even Tetragnatha. Perhaps they really ought to have Theridiosoma too, and in pride of place! Gluing the bottom half of your web to the water and catching pond surface insects should be enough to get you a mention in a pond-life book even if you are tiny! I visited an ancient woodland with a pond in West Sussex yesterday and although a lot of Theridiosoma were found within damp areas without standing water, on the pond itself many spiders had used the leaves in a patch of Bogbean (Menyanthes) as a top anchor with lower half of the web on the water. The webs are effectively invisible, but the raised meniscus where each line is anchored stands out if one looks carefully and sometimes the reflection of the tiny suspended spider against the sky! This really looks like a special adaptation to me rather than just coincidental. Maybe others may want to keep a lookout in similar habitats?